The 5100 Series offers traditional Bilstein technology with applications for stock height and lifted trucks, Jeeps and Prerunners. 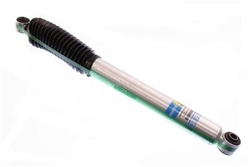 The Bilstein 5100 Series shock absorbers are designed to be a direct replacement. 5100 Series shocks feature Bilstein 's superior single tube high gas pressure design for the utmost in consistent fade-free performance and long life. Bilstein 's patented Digressive self-adjusting valving delivers improved damping control and a smooth ride on all road surfaces at any speed. This is for 1 Rear shock.